According to legend, our early ancestors Adam and Eve were doing just fine living in paradise. They were happy, peaceful and in love, friends with all of Creation. Then they ate from the tree of “knowledge of good and evil” and all hell broke loose. Now, most of us don’t believe this myth to be factually true, yet symbolically it fits our situation on this planet pretty well. Dualistic and compartmentalized thinking- believing that people and phenomena belong to separate and opposed categories such as us/them, friend/enemy, good/evil, and man/nature- is at the root of most of the human race’s greatest suffering, confusion and unhappiness. In reality, “man-made” conceptual categories that appear to be opposites are often two sides of one interconnected whole. Pretty much every major difficulty the human family has been struggling with exists because the dominant “civilized” cultures have thought dualistically about the world, failed to see the mutual interdependence of all that exists in our lives and the Universe. 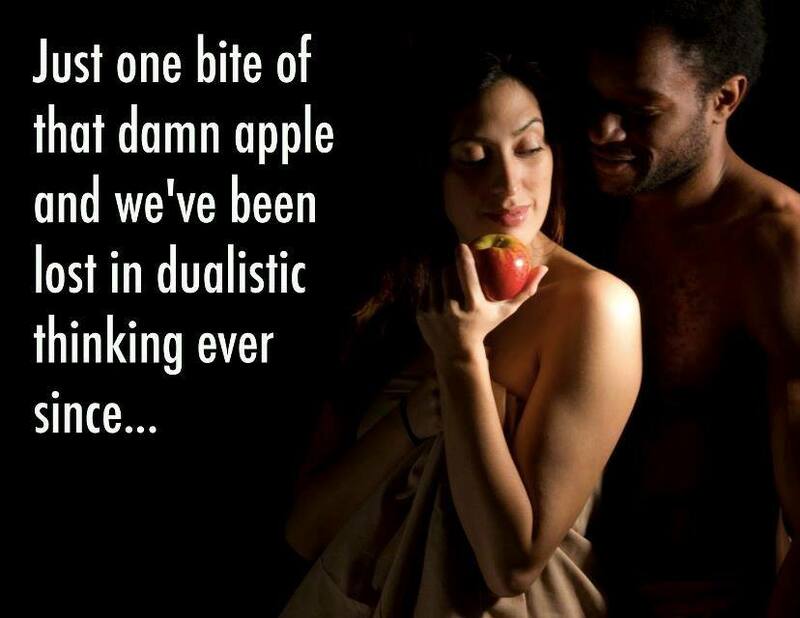 As happened with Adam & Eve, it’s like we fell under a spell. Collectively lost in delusion, many cultures and communities have forgotten that all life needs to be respected and cherished, that humanity is one family, sisters and brothers to one another, to the animals and the natural world. In a sense, we’ve never really left Eden except in our imaginations. Lost in our dualistic beliefs we’ve seen every problem we face as something to battle- with wars on drugs, wars on poverty, crime and real bomb dropping wars on other people. Problems never get solved that way, cause the only way to solve a complicated problem is to use wisdom, which begins by trying to understand the true nature of what you’re struggling with. And that requires stepping outside the limited faulty mental frames of compartmentalized thinking. And the earth is your home. This entry was posted in Creative Systems Thinking and tagged christopher chase, creative by nature, creative systems thinking, creative universe, ecology, interdependence, spirituality, wisdom. Bookmark the permalink. Great post and video, Chris — it’s clear that the only way we are going to mature, both individually and collectively, is to see through and transcend the conflict-laden paradigm that has resulted from dualistic thinking. The problem is that this obsolete model has been relentlessly programed into every aspect of our lives, like a glitch in the software. Consequently, to clear that glitch requires that we be willing to question all of our cherished beliefs and assumptions, and that takes both courage and persistence. One great help we do have available, as you have regularly pointed out, is the community of spiritual friends (sangha) — like-minded people who together can forge a new and wholistic paradigm, free of the internal divisions that currently define the body politic. Thanks so much for your efforts! Great points, so good to hear Alan’s wisdom living on through the media too! Thanks!